A few years ago, I built a turbocharged, Air-conditioned, camper, caravan, autocaravan, motorhome in India [RV or recreational vehicle]. It would be just the thing for a rally support truck, disaster relief, rural medical clinic, volunteer work, or just for fun. No need to drive to India overland through unstable countries, or for an expensive carnet or difficult visas. 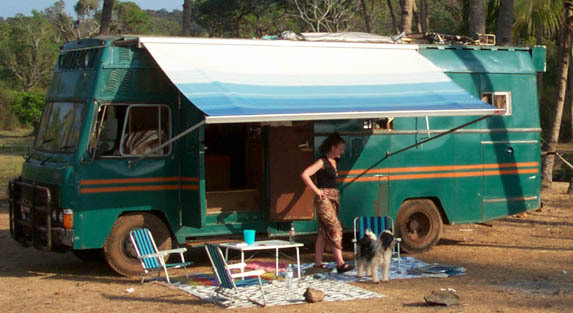 This is an Expedition camper; see how to choose or build an expedition camper by Stephan Stewart. Due to other projects and commitments, I don't have time for it anymore. The most important part of this vehicle is the registration. It's registered in the state of Goa, not as a bus or a truck; on paper, it's a 7.5 meter, 6 ton car. As a private vehicle, it can be freely driven throughout India. Commercial vehicles require special permits to cross state lines. I started with a new 7 meter Mazda T3500 rolling chassis built in India. Many of the engine parts [perhaps the whole engine] is Japanese import, but it has a Bosch type injection pump [service available throughout India and most of the world]. There is about 8,000 km on it. I added the turbo* to give it some better uphill and overtaking power. It's still a truck, but more drivable now. I estimate the power at about 120HP [from 85]. It can make more very easily, but would need a heavier clutch pressure plate. The engine runs cooler now than stock, due to the large intercooler. Ask me for details of the engineering if you're interested. It should have nearly full power up to 5000 meters [Rotang pass]. It's a 3 cylinder 900cc Mitsubishi engine coupled to a 5kva Honda alternator. However, without an extra speed control, it can only produce about 2.5 Kw at 220V. There are 2X 80A 12V alternators* with double belts and custom voltage regulator [see Voltage regulator for DC alternators], and a Sanden air-conditioner compressor*. it can be converted to run 134a refrigerant according to Sanden, but is now on R12. it can run at several speeds, switched from the generator control panel above the driver's seat [220V only at full speed, 2200rpm]. It has it's own oil, temp, and tach gauges too*. Parts are available from Mitsubishi industrial, throughout India and the world. It has a large capacity for cooling while on the road, and can be run on quiet mode at night. it can be run from the main engine without the generator running while driving; the main engine has a compressor* and an extra 80A alternator* fitted. let me know if you want technical details. LPG [for cooking and the fridge] 2 X 13kg [one local HP bottle] I have a trick for filling them from any available LPG bottle. Write me if you want it, I got it free and I pass it along. Aluminum plate on wood on steel. the framing is very strong, a full steel cage with gussets welded everywhere. Insulated with 7cm of polystyrene. there is a huge luggage compartment in the rear, as well as a couple of smaller ones. the generator has a custom compartment on one side. All the glass is toughened automotive standard, and slightly tinted. Not like that plastic stuff they use in the West. There is 1 big double bed, the dining seats were made to fold into a bed but that was never quite completed. the 2 driving seats are imported asa car seats from Europe. There are 2 sets of terrycloth covers for all the seats. The interior is all teak paneling and trim. The dining table is solid block Burma Teak. Sorry I don't have better interior pictures at the moment, but the interior is built to be spacious for 2 people and a dog or small child. It's made to be easily modified though; the dining table and seats can be moved or removed quickly, and there's extra space. There's also lots of storage area inside the truck. I carry things on top, too [my windsurf boards]. The body and interior were built at a bus factory in Goa under my supervision. I am an American who has spent some time there. I still have contact with the builder, so modifications are possible. The vehicle has always been garaged and well cared for. The engines are both started once a month, but it has been garaged for about 5 years now, and will need a bit of attention. At this new low price, I'm not going to travel to India to clean the truck and sort out any small problems in the house systems. It will be sold in good roadworthy condition with a new start battery, ready to drive to wherever you want to take it.